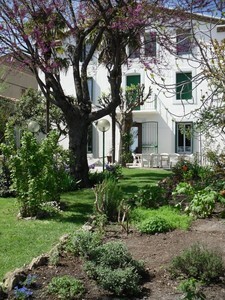 It is a large mansion dating back to the 19th century, located in the old village. It is built on the hillside of the city walls, facing Enserune oppidum overhanging the pond of Montady. You can also see the city of Béziers and its cathédral, Baudille Peak and the Espinouse Mounts. You can walk to the tower (400 yards away), go to the Canal du Midi and its Marina (2 miles), or to the beaches (12 miles). Miette and Jorgelino you receive in the warm house of 19th St., built on the hillside on the ramparts, facing the Oppidum Enserune overlooking the star Montady, close to the Canal du Midi and its port craft. Soak up the morning dew with a breakfast on the terrace of a flower garden and discover our region. Schedule a boat trip to discover nine locks Fonserannes on the Canal du Midi in Beziers. Enjoy the sandy beaches of Sérignan Valras or Cap d'Agde which have preserved their shores. Experience intense moments with bullfighting traditions of Beziers, the jousting tournaments at Sète and festivals in the region. Discover Languedoc culture with our museums, theaters or the large Media Andre Malraux and the media Occitan "Lo CIRDDOC"